A young girl named Allison read about the tragedy and sent Davis her allowance money as a contribution to the purchase of bulletproof vests for the canine unit. The story went viral. Police dogs killed in the line of duty receive the same honors as their human counterparts. Davis commemorated his partner by having the dog’s name, paw print, the acronym EOW (end of watch) and Jethro’ s date of death tattooed on his shoulder. There are approximately 50,000 police dogs working in the United States. While these dogs are bred specifically for this purpose, not every puppy makes the cut. Shy, nervous dogs must find another career, because these personality traits could lead to trouble on duty. Suitable candidates are not only smart and alert, but relatively calm. These dogs are put to the test in simulated environments, and their reactions are gauged in stressful, chaotic situations. They must obey commands even in the midst of loud noise, gunfire, smoke and other extreme distractions. The ones who make it through this K9 boot camp become patrol dogs. Dogs learn to sniff out certain items by having that odor imprinted on a favorite toy. The toys are hidden and the dogs must locate them. Handlers train the dog to sit when he detects the odor. The dogs are brought to different places — such as airports, train stations or forests — to test their skills. Dual-purpose dogs are trained for patrol as well as explosive detection, or patrol and narcotic detection. They aren’t trained for both types of detection. Dual-purpose dogs are more often found in the K9 units of smaller municipalities, where budget limitations make purchasing single-purpose dogs difficult. An investment in a dual-purpose dog also alleviates certain manpower shortages in local police departments. Belgian Malinois — Also known as the Belgian shepherd, this breed is similar to the German shepherd, but somewhat smaller. Dutch shepherd — This dog resembles the Belgian Malinois, except a Dutch shepherd’s coat is always brindle, which is a brown base coat with dark striping. Labrador retriever — This good-natured and very trainable dog is used for detection work. Giant schnauzer — This large, powerful dog is used as a dual-purpose animal. Bloodhound — The bloodhound, with his superb scent, is used specifically to track missing persons or fugitives. Beagle — Friendly and playful, this “nose with four legs” isn’t going to strike fear into anyone, but is often used as a detection animal. Patrol dogs are not cheap. Patrol dogs are often obtained from specific European breeding stock, with a young dog averaging about $8,000. There’s the cost of airfare to fly the dog to a training facility and the training itself, which can run $15,000 or more. American breeders are now producing top-quality dogs for police work, but purchase prices are still significant. The National Police Dog Foundation notes that K9 units are specialty units — meaning the department could run without them — so many dogs are purchased through fundraising or corporate donations. Other costs, such as bulletproof vests, are dependent upon donations. The average police dog enters the department at about 15 months and is retired at about 10 years of age. Detection dogs cost relatively little to purchase, and some may come from animal shelters. Even though the purchase price is minimal, there is still extensive training involved. 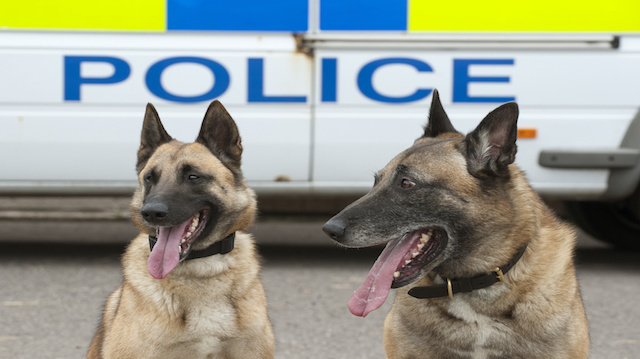 When police dogs retire, they generally live out the rest of their days with their handler. Jane Meggitt graduated from New York University and worked as a staff writer for a major New Jersey newspaper chain. Her work on pets, equines and health have appeared in dozens of publications, including The Daily Puppy, The Nest Pets, Horse News, Hoof Beats and Horseback magazines. Hey Buddy!, I found this information for you: "Dogs That Deserve Honor: Police K-9 Units". Here is the website link: https://www.thealternativedaily.com/police-k-9-units/. Thank you.